Fun Stuff to Make: Eggrolls! * You can also add in tofu, soy sausage, whatever you like. 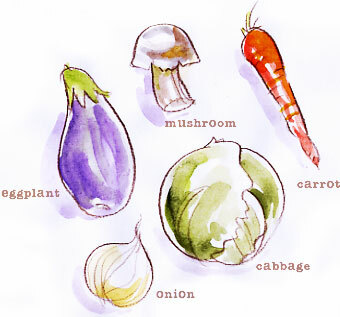 Finely chop the cabbage, onions, eggplant, and mushrooms. Grate 2 carrots. Cover the bottom of a pasta pot with olive oil and add all the vegetables. (Cook ONLY veggies at this point.) Top with soy sauce and ginger, and stir everything all together. Place lid on top of pot and cook down, stirring regularly until veggies are cooked to your liking. (We liked the vegetables softer, so the veggies cooked to about half the original volume.) Let cool. If adding tofu/soy sausage, mix in now. You will need 2 non-stick cookie sheets. 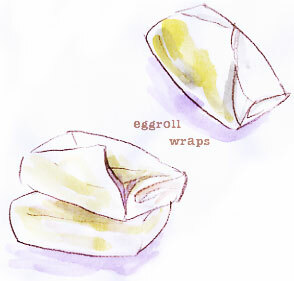 Following the directions on the package of eggrolls, fill the wrappers like an envelope and place on the cookie sheet. Drizzle olive oil on top and bake in 350-degree oven until eggrolls are golden and slightly bubbly on top. Let cool. Serve to hungry kids with dipping sauce (soy sauce or your favorite) and rice. Reheats best in a toaster oven, as they get a bit juicy in the microwave, not that my kids minded much. :) Makes enough for a family lunch and a few snacks for mama later. In which I admit I do not have superpowers.